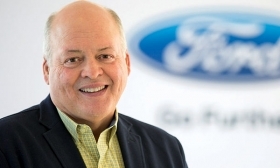 Ford CEO Jim Hackett mentioned the automaker's investment in Autonomic during a presentation to investors last week. Ford Motor has begun to develop new transportation service applications using a software platform developed by Autonomic, a small Silicon Valley startup. One of the first such businesses is a "microtransit" service called Non-Emergency Medical Transport, launched this summer by Ford and Michigan-based Beaumont Hospital. Patients can schedule pickups and appointments from a mobile app that was built on the Autonomic software platform, said Sundeep Madra, Autonomic's CEO and co-founder. Ford in the past month has announced partnerships with Domino's and Lyft, using self-driving vehicles developed by Ford and its Argo affiliate. The automaker is also experimenting with a service called Chariot that offers access to van rides. In an investor briefing, Jim Farley, Ford president of global markets, said the most important part of the company's strategy in self-driving vehicles "is a diverse group of revenue streams ... not just one revenue stream like ride- hailing, but multiple revenue streams," including providing digital content to vehicle occupants.